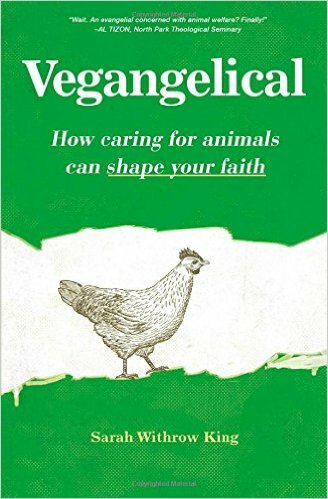 Sarah Withrow King, the author of Vegangelical, always felt the desire to help others. She knew that her mission in life was to serve those less fortunate, although she didn't really have a direction until she happened to read a pamphlet about the suffering of animals raised for food. This led to her becoming a vegan and refusing to use products made from or tested on animals. After college, she began working for PETA, where her devotion to animal rights issues didn't always sit well with her church family. A devout Christian, King was horrified by the justifications that humans use to harm animals, which she saw as "God's created beings." Eventually, she attended seminary in order to better merge her faith with her vocation. The book is divided into two main sections. The first discusses how humans, being made in the image of God, should interpret the ideas of stewardship and love towards animals. The second part is a stark look at how animals are currently used in a variety of ways by humans: as pets, as entertainment, for food, for clothing, for research purposes, etc. There are plenty of examples of cruel and unnecessary treatment of animals which help to illustrate the author's compassionate and faith-based advocacy for better treatment for all creatures. Each chapter ends with questions designed to help the reader think more deeply about the issues raised. The conclusion gives suggestions for how people can begin to be more thoughtful in their daily lives in order to incorporate the principles in the book. Throughout the book she quotes Biblical passages which support her ideas. 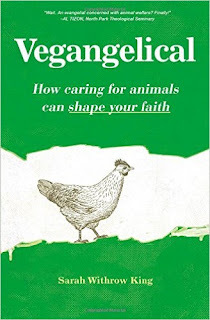 It was very interesting to read about the author's own struggles to give up meat and adapt to meals/gatherings where she is often the only vegan present. Of course she lists all the ways that giving up animal products in her diet has helped her become more healthy, but she doesn't skip over how difficult it was initially to overcome her cravings for meat and cheese.